Like all Gemini facility instruments, NIFS is operated through the Gemini observing tool (OT). This page guides you through the main steps and considerations for configuring NIFS observations in the OT. If you are unfamiliar with the OT for NIFS, then the following information will introduce you to the basics. If you are familiar with the NIFS OT, then you might jump to the next section and start defining your phase II proposal. Basic information on the OT itself is available here. Together with the information and examples given in the NIFS OT library, you shoudl be able to configure your observations within the OT. Please also refer to the general NIFS pages for further information on the instrument. Once you have completed your phase II, please see the NIFS checklist to verify the completed phase II program includes all of the items a PI needs to consider to get the best out of their observations. Typically, the grating for the observation is chosen first. NIFS has four gratings physically mounted in the dewar. Each default configuration of grating choice uses a dual blocking filter, one of Z-J, J-H, or H-K for Z and J, H, and K gratings, respectively. The grating/filter tables explain the proper combinations. Once the grating is selected, the default central wavelength will automatically be entered into the NIFS component. NIFS covers essentially all of the associated photometric band in one shot, and the default settings (see grating/filter tables) are designed for this case. If the filter is chosen as "Same as Disperser", then the appropriate default blocking filter is selected at the time of observation. 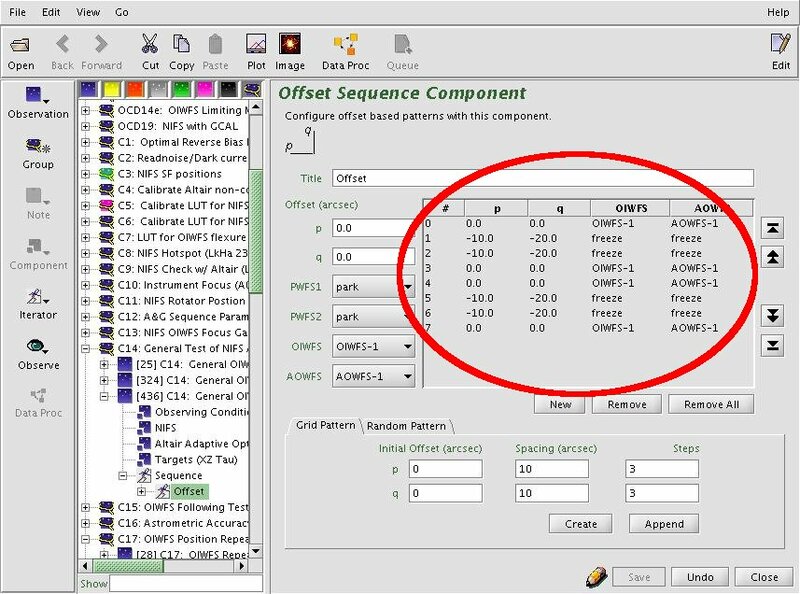 The instrument can be configured to modify these default grating settings by choosing a different central wavelength, these setting are described in grating/filter tables. This should not be necessary for most programs, however, at least three addtional possibilities may be useful. One is to rotate the grating turret to shorter K band wavelengths to observe further into the telluric band near 1.9 um. Paschen alpha, for example, can be observed from Mauna Kea on dry nights. Similarly, one can observe at longer K band wavelengths. The focal plane mask should be "Clear" for regular observations. For coronagraphy, several focal plane occulting masks are available for observations of bright targets with faint companions. For acquisition sequences, an "Imaging mirror" should be selected: chose ";b>in" for this case, otherwise "out.". The exposure time is set by clicking in the dialog box and typing the required number of seconds. Each occurrence of the observe element will cause N exposures to be taken and coadded in the instrument control system resulting in a single image written to disk. The value of N is set by typing an integer in the "coadds" window. The total integration time in each output image will be the "Exposure Time" times the number of coadds. The facility Cassegrain Rotator can rotate the instrument to any desired position angle. The angle (in conventional astronomical notation of degrees east of north) is set by typing in the "position angle" box. The view of the science field in the position editor will reflect the selected angle. Alternatively the angle may be set or adjusted in the position editor itself by interactively rotating the science field. Choose either bright or faint object mode. Objects fainter than about K~10 should use the faint object mode. The array chacteristics given in green at the bottom of the OT screen will get updated when a different readmode is selected. It is possible to use NIFS in stand-alone mode (without ALTAIR); please see the Guiding Options page for details. Guide corrections for non-AO NIFS observations are provided by the Peripheral Wavefront Sensor, PWFS2. 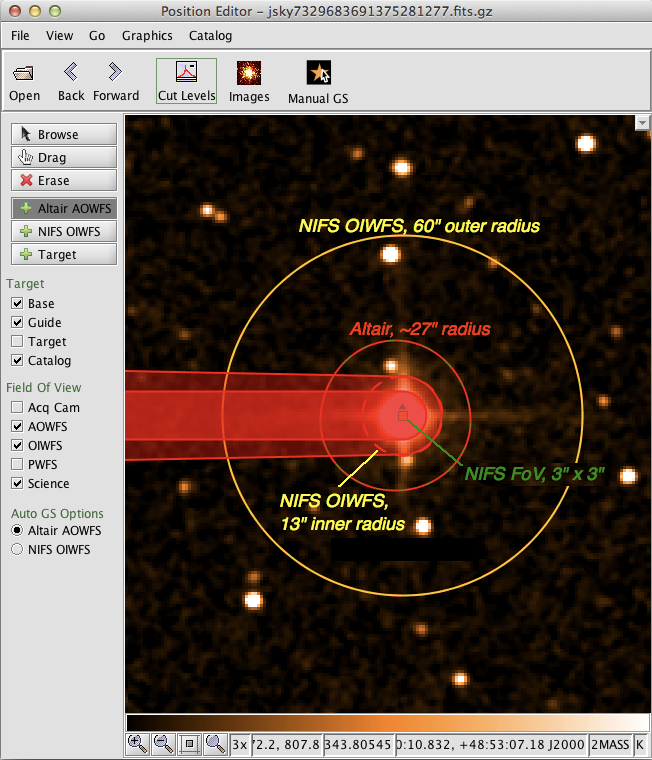 To use NIFS with AO mode, an ALTAIR AO component should be included in your observations, and AO guide stars must be specified. This component must be included in the observation only if NIFS is to be used with Altair. The component allows the observer to choose a dichroic for Altair. The 850 nm - 2.5 µm dichroic should be used with NIFS. Observers should choose the default "following" for the Cass Rotator to take out field rotation and keep objects fixed on the NIFS detector. The OT includes a selection for the Altair field lens. 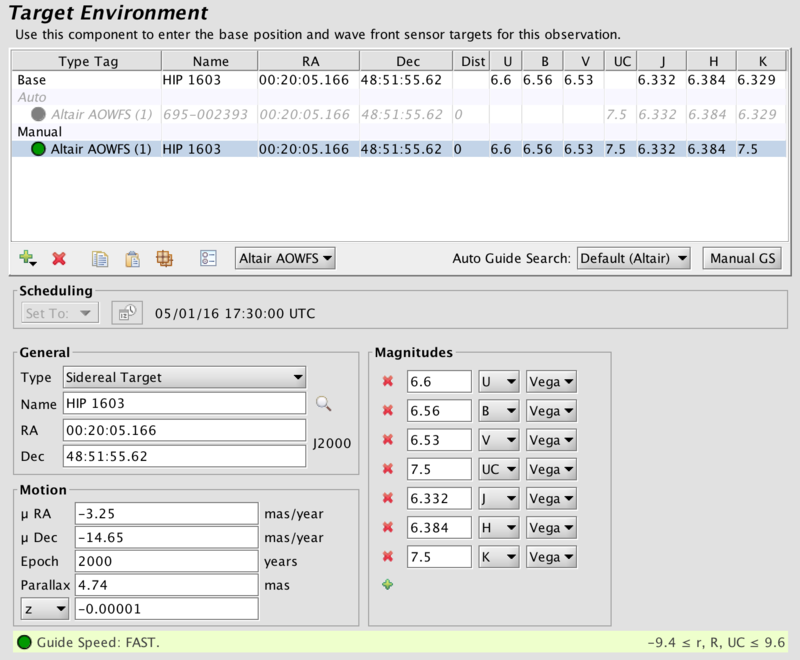 The Altair "AOWFS" star is specified in the targets section of the main observation as shown below. For on-source correction of the wavefront, the coordinates of the AOWFS star should be identical to the target coordinates (the Dist field should show "0"). Information about the base position (i.e. the science object) and guide star(s) may be editied by clicking the appropriate line in the target table at the bottom and then editing the various fields through the text boxes above. Changing the type of target may be done using the "tag" pull down menu at the upper left. 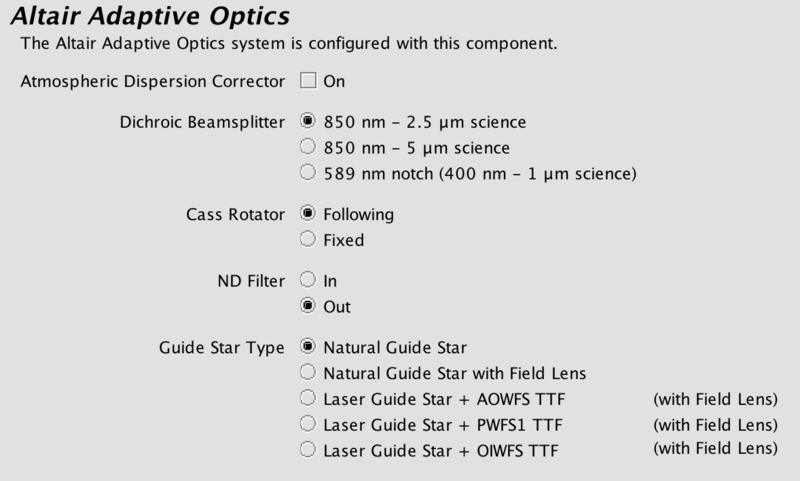 The OT will automatically select UCAC4 guide stars based on the instrument configuration and conditions. Details are given on the guide star selection help page. Manually-selected guide stars can be added (green +) or deleted (red X) manually. You can also use the Position Editor to query an image of the field and add stars interactively from the UCAC4 or PPMXL catalogs. An example image field is shown below (from the position editor) with the science field (small green box) and WFS fields overlayed (red and yellow circles). The NIFS pickoff probe is outlined as well in red. The yellow circle is the OIWFS field and the red/green egg shape is the useful Altair field for wavefront correction. Since the AO fold mirror in the Cassegrain instrument cluster first sends the telescope beam to Altair, the Altair field is unvignetted. The NIFS science field pick off will vignette the OIWFS field as shown. If using Altair then the outer limit of the OIWFS field depends on the Altair field lens option and the display will update accordingly. The Cassegrain rotator may be adjusted (position angle) to access OIWFS guide stars which would otherwise be vignetted. All observations must have a guide star. This will usually mean at least an AOWFS star. AOWFS stars should be as bright and close to the target as possible, and no further than ~27'' away. See the Altair pages for full details, or the NIFS guiding options page for a summary. Always make sure to check that the selected observing conditions for cloud cover (CC) are consistent with the guide star brightness.The OIWFS can be used in combination with the AOWFS star for long observations where flexure between NIFS and Altair might be important. See the guiding options section for more details. Attenuation of light from the target will greatly depend on how well the object is aligned behind the coronagraph of choice. As a result, every coronagraphic observation should have a dedicated acquisition sequence. For good suppression of scattered light, your target should be aligned with the center to better than ~10% of diameter of the occulting disk. For an example of coronagraphic observation acquisition sequence, check coronagraphic observation samples in the OT Library for NIFS. The smaller the occulting disk, the longer it will take to get your object properly aligned behind the mask. If your coronagraphic observation requires sky frames between target frames, we strongly recommend that you only use the larger, 0. "5 occulting disk for your observations. When offsetting to sky, it is much more difficult to keep a target adequately centered to <0. "02 behind the small 0. "2 occulting disk. Using the 0. "5 disk will result in less observing overhead because of target centering and will result in more efficient observations. For sky offsetting, your phase II file needs to set guide stars to the "freeze" state for your sky offset position. This means that you need to set AOWFS and OIWFS to "freeze" if you are observing with NIFS+Altair+OIWFS (see the example below). The NIFS Sequence Iterator is a member of a class of instrument iterators. Each works exactly the same way, except that different options are presented depending upon the instrument. Use this component to change the instrument configuration during the observation, for example, to repeat the same basic observation at two grating settings. For observations that take a significant amount of time (approximately greater than 1 hr) iterating the instrument configuration between multiple gratings is not a good idea. This is because observing conditions may change, calibrations need to be taken, or the queue operator will only have limited time on any given night to complete part of the observation. In this case, break up NIFS observation into a separate "Observation" and best practice is to cut and paste your observations and change the instrument configuration for each separate observation. This allows for more flexibility at the telescope. Short observations of bright targets are good candidates for an instrument configuration iterator. In the above figure, the iteration table shows parts of observe 4, 5, and 6 (of 20 total). The first five exposures are taken with the step 1 configuration (in this case the K grating) with the telescope dithering before each exposure (p, q offsets). After step 5, the instrument is re-configured with the H grating for the next five offset exposures. Rows or columns may be added and removed at will. Rows (iteration steps) may be rearranged using the arrow buttons. Rows will be added or removed by clicking "Ad Step" or "Delete Step" buttons, and columns can be deleted by clicking "Delete Item". Adding column can be done by selecting one from the "Available Items" box.